It has been very blustery on the Island where we live. It makes me shiver to look outside. My usual pattern of walking has been curtailed by periods of rain, wind, snow and sleet. While I am well equipped with Paddington Bear rain gear, there is definitely a small voice coaxing me to stay inside where it is warm and cosy. During a sunny break amidst the storm clouds yesterday, we overcame the elements to stock up on groceries. My eye caught a display of purple potatoes which became my inspiration of the day. Earlier in the week, I made adult play dough, namely, Chocolate Gnocchi. 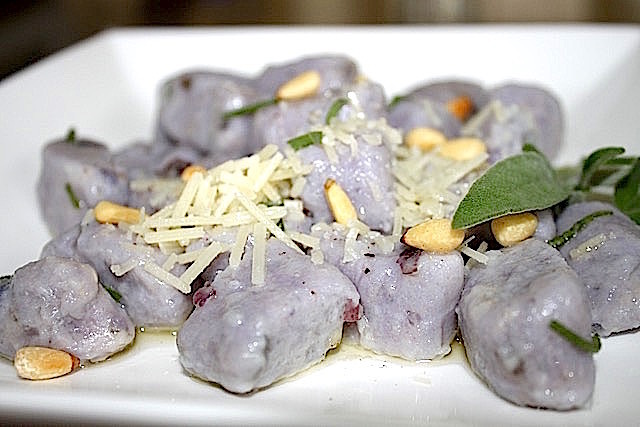 That little culinary exercise was so much fun that I decided to experiment a little further and make a savoury purple potato gnocchi! Talk about a really cool experience, and colourful to boot! It was very easy to make, roll, cut and boil – and super tasty! The colour of the potatoes changes every so slightly. My CHEF TIP is to add a little white vinegar to the water to help retain the colour of these beautiful purple potatoes. 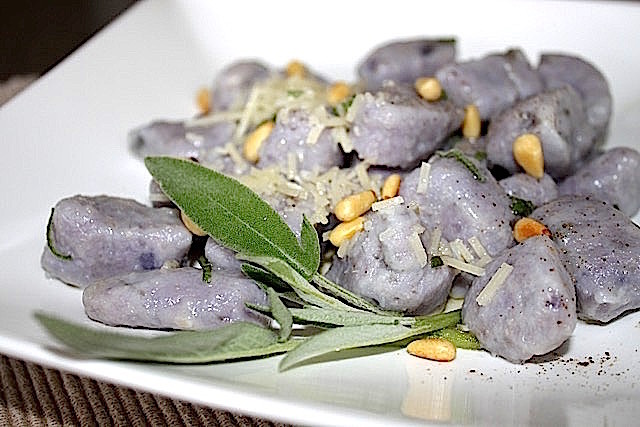 I served the purple gnocchi with a brown butter with a chiffonade of sage, shredded parmesan cheese and toasted pine nuts. A colourful roasted vegetable medley accompanied the gnocchi for a very attractive and simple meal. We are now looking forward to the next blustery day when we can once again enjoy the uncooked portion from the freezer reserve. CHEF TALK: Try this delicious gnocchi recipe. It is a simple process of adding a balance of flour, cheese, egg, and seasonings to the mashed potato to make the gnocchi dough. Put the potatoes in a pot of cold water with a few tablespoons of white vinegar in the water to set the colour of the potatoes. Salt the water very well. Boil the potatoes until they are tender. Peel the potatoes and mash them until smooth. Put another pot of salted water to boil (for the gnocchi). On a floured surface, turn the dough out and separate it into 4 – 6 smaller manageable pieces. If you must, rest the dough on the counter, covered with a kitchen towel for 30 minutes, or you can start playing straight away. Roll each piece between flattened palms and roll into ropes (snakes) from about ½ inch to one inch in diameter. (I like smaller gnocchi). Cut these into ½ inch to one-inch pieces with a knife or plastic scraper. As you cut the ropes, toss them onto a parchment-lined baking sheet. Sprinkle the gnocchi lightly with flour and toss to keep the gnocchi from sticking to each other. When the water comes to a boil, boil about ¼ of the gnocchi at a time until tender. They will float up to the surface. They will be cooked in about 5 minutes. With a slotted spoon, lift the gnocchi out of the water onto a tray until required. In a small saucepan, cook the butter until the butter solids are browned with a nutty fragrance. This will take about 5 minutes. Set aside. Toss a portion of the hot gnocchi in with the browned butter. You can do this as soon as the gnocchi is boiled, or you can make the gnocchi ahead of time and then rewarm the gnocchi in a saucepan in the browned butter. Place the warm gnocchi in serving bowls. Sprinkle with finely cut fresh sage, shredded parmesan and toasted pine nuts. To store the gnocchi for longer storage, place the cut raw gnocchi on a parchment lined tray. Make sure to toss them lightly in flour to keep them separated. Freeze the gnocchi in a single layer until solid, then transfer the gnocchi into a pail or freezer bags for your freezer reserve. Cook, following the directions above from frozen state. 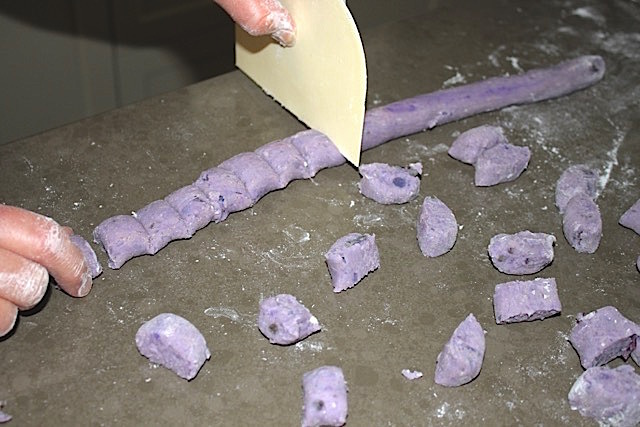 If you also feel like being playful, give this recipe for Playful Purple Gnocchi a try. If you do, please come back and leave me a comment below with your feedback.